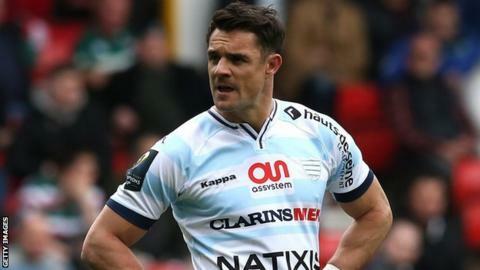 Saracens would be making a big error by targeting Dan Carter during Saturday's European Champions Cup final, says director of rugby Mark McCall. New Zealand World Cup-winning fly-half Carter, 34, has helped Parisians Racing 92 to their first European final. Carter is the reigning World Rugby player of the year and the leading points scorer in Test history. "It's a big, big, big mistake to think you're going to go and get Dan Carter," said McCall. "Dan Carter's been doing this for a very long time. So we've got to make sure that his influence in the game isn't huge, isn't unbelievably significant. "And if we can do that it means our pack have got on top in the scrum, in the line-out. It means we'll have put a little bit more pressure on him than he's experienced before. "But if you run down his channel and think you're going to shake him up, you're not going to." Saracens' England fly-half Owen Farrell is keen to emulate Carter's unflustered approach. Farrell, who has just returned from a two-week ban for a dangerous tackle, said: "He's been there and done it so many times. It's just how calm he is, how much he is in control of what he does that stands out. "Trying to be calmer on the pitch, it's definitely something I'm always trying to do."